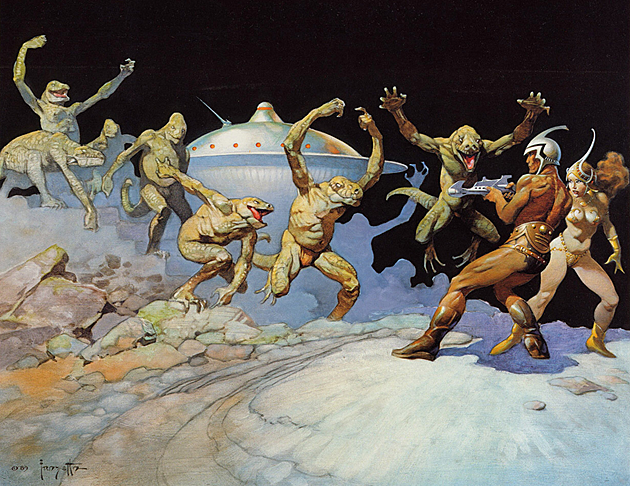 Image used with permission from Frazetta Girls LLC. ‘Leaping Lizards’, from 1989, immediately reminded me of the great monster movies from the 1950s such as It Came from Outer Space and THEM! The painting has an air of comedy to it with some of the lizard-like creatures flailing their ape-like arms over their heads while others appear to be smiling their toothless mouths. A spacecraft looms in the background, though it’s unclear whether our poorly clad heroes arrived in it or the menacing lizard men. Either way, the ambush seems to be successful as the “heroes” are perilously pushed to one side of the painting, while not a single green assailant shows signs of conceding. This music consists of several monster movie clichés: Heavy angular brass motifs ending in a rising major seventh, screeching woodwinds, and frequent chromatic lines and augmented arpeggios. To lighten the melodramatic mood, jazzy themes convey the humorous tone of the painting. The painting ‘Egyptian Queen’ features a queen bathed in a colorful dress, leaning against a marble pillar, flanked by a guard and leopard. The details of this painting are intricate, light reaches only the most central objects in view, the base of the pillar is weathered, and carefully placed bits of color adorn the scene as subtly as accessories adorn the ruler. The music begins with an ancient horn call atop a jingling dance rhythm that prevails throughout the composition. A piccolo flourish becomes the main theme for the work and is passed off to different soloists. Finally, the piece ends with the piccolo returning stating the theme once more. The theme, however, seems to fall apart only to suddenly and flamboyantly curl back up, disappearing in a flash. 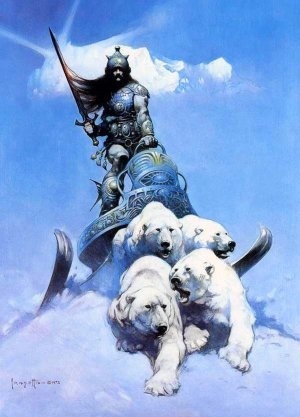 ‘The Silver Warrior’, represents the strong figure as he is pulled by four determined polar bears on a sled over snow. The piece is monothematic in form, lending to its concise style. The music moves forward in hopeful resilience and ends as rousing as the icy mountain range that adorns the background of this scintillating painting. 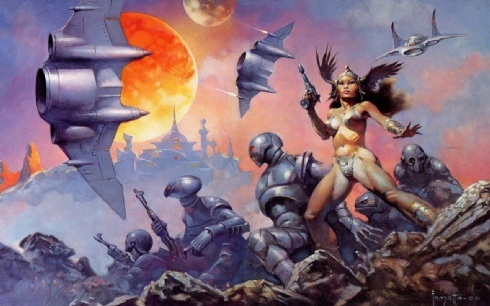 ‘Dawn Attack’ features alien creatures dressed in metallic armor charging to an unknown enemy led by a pistol-wielding woman warrior. In the sky appear two reddish moons, a futuristic city, and soaring spaceships. In this painting, all movement lunges to the left side of the picture, while the heroine seems to pause for a moment to peer down at the viewer. This music features brief, churning motifs that propel the music forward, mirroring the fast-paced unrelenting mood of the painting. Frank Frazetta was a Brooklyn-born painter who became the most influential artist in the “sword and sorcery” fantasy genre. Featuring sword-wielding barbarians, scantly armored women, and ghastly creatures, Frazetta’s paintings are dynamic and filled with imagination, they are a journey into unknown places and adventures. This suite consists of four movements, each depicting the drama found in the accompanying paintings.